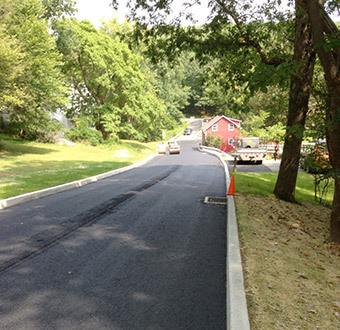 In 2012, Hanover Engineering assisted Jackson Township with the reconstruction of Twin Pines Road. The road is narrow and steep, with slopes exceeding 10 percent, which created erosion and runoff problems especially in the winter months. The Township decided to widen the travel lanes, provide paved shoulders, and install a stormwater collection system and concrete curbs to assist in the control of stormwater runoff. The project required a Stream Encroachment Permit from the US Army Corps and PA DEP for the new outfall to the Kettle Creek. Hanover Engineering prepared and coordinated the permit submission to the PA DEP and Monroe County Conservation District and upon the issuance of the permit, prepared the bid documents and assisted the Township in bidding the project. Due to higher than expected construction costs, the Township elected to reconstruct the road in two phases. Hanover Engineering coordinated payment reimbursement to the Township with DCED, since the project was partially funded with a Local Share Account Program Grant (LSA Grant). Phase I of the project was advertised in spring of 2013 and construction was completed in August of 2013. Phase II was advertised in early 2014, construction commenced in April, and the project was completed in June 2014.